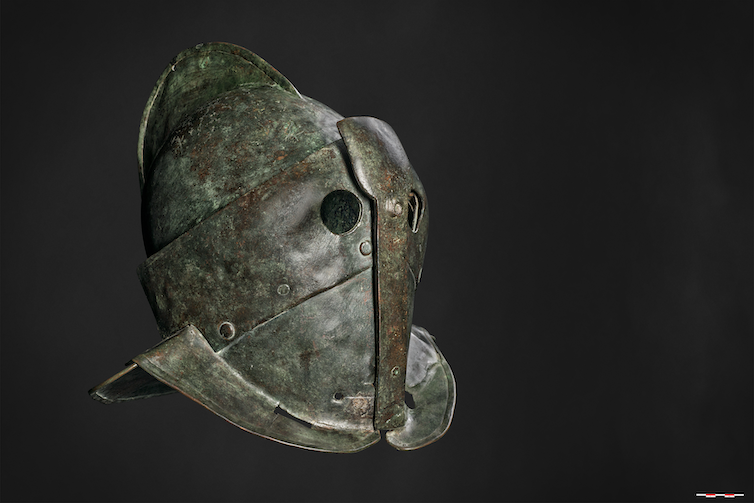 The helmet of a heavily armed ‘secutor’, first century AD. The gladiator was the product of a unique environment. He can exist only within a very particular set of religious, social, legal, political and economic circumstances. It is not surprising that this is a form of spectacle we have not seen either before or since the Romans. To acknowledge this is also to acknowledge that they are only ever going to be partially comprehensible to us. 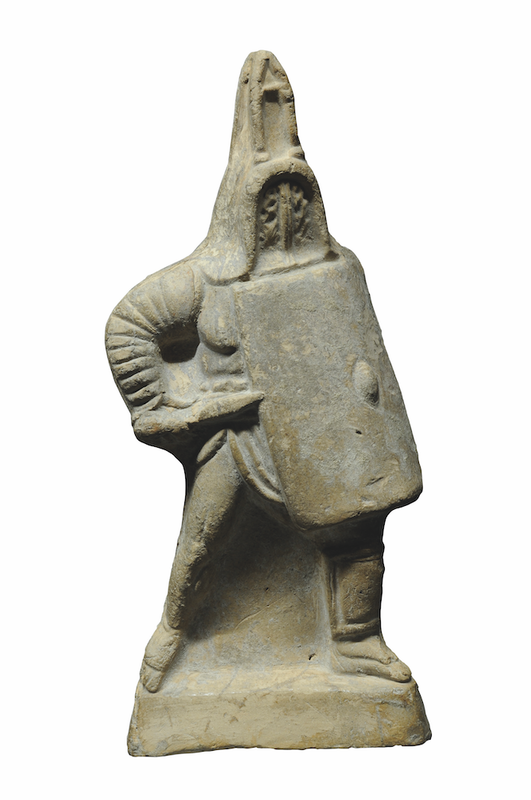 Statuette of a Gladiator from Murmillo, first century CE. Sadly, this is not a view shared by the Queensland Museum, which last week opened its new exhibition, Gladiators: Heroes of the Colosseum. The exhibition brings together 117 objects from Italian museums, most notably the collection of the Colosseum at Rome. Highlights include some extremely well preserved and intricately decorated gladiatorial helmets and pieces of armour from Pompeii, as well as some very fine carved reliefs depicting scenes of combat. Yet, while the quality of the individual objects is without question and certainly worth the price of admission alone, the intellectual framework of the exhibition is far more problematic. This is not an exhibition that is plagued by doubts or uncertainties. It firmly knows who gladiators were and what they stood for – gladiators, the opening panel of the exhibition proclaims, were the “elite athletes” of the ancient world. The antique equivalent of today’s fighters in the popular sport MMA, if you like. Sporting analogies pepper the exhibition. Spectators are routinely referred to as “fans” and the catalogue promises that this is an exhibition that “touches on many issues that have parallels with modern-day sport and sporting culture”. At times, the exhibition also feels like it has taken its cues from contemporary video-game culture. The special weapons of the various types of gladiators are spelled out and visitors are invited to contemplate who would win between a gladiator fighting with a net (known as a retarius to the Romans) and one heavily armed (secutor). A video-game spin-off from the exhibition is easy to imagine. Gladiatorial combat was certainly popular among the Romans. Evidence for gladiators is found in every province of the Roman Empire. These fights initially began as contests of matched pairs as part of funeral rites honouring the dead. However, over time their popularity grew. By the time of the Roman Empire, hundreds of gladiators might be involved in spectacles that could last as long as 100 days. These games were never just displays of gladiatorial fighting. At their most elaborate they involved beast hunts with exotic animals, executions of criminals, naval battles staged in flooded arenas, musical entertainments and dances. The Queensland Museum is not the first to try to understand gladiators as sporting heroes. However, this analogy causes more problems than it solves. The vast majority of gladiators were either prisoners of war or criminals sentenced to death. Gladiators were the lowest of the low; violent murderers, thieves and arsonists. Even your most badly behaved football team at their most morally blind would have had no trouble in rejecting this crew. 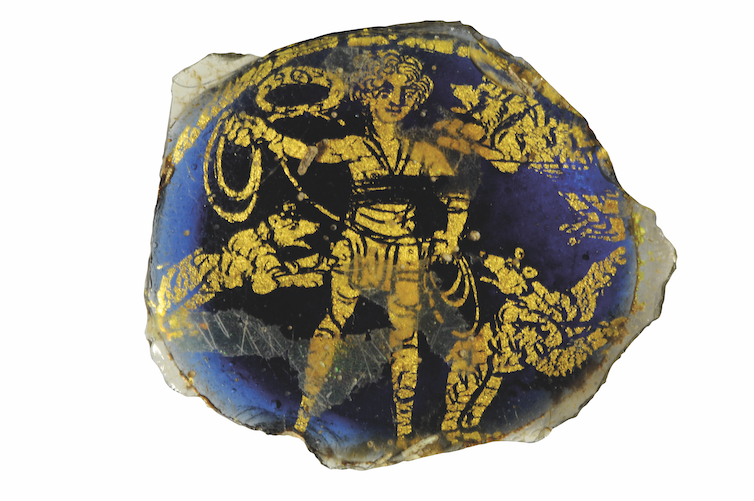 Gold glass medallion with a scene of a fighter killing wild beasts. fourth century CE. Rógvi N. Johansen, Department of photo and medie Moesgaard. All rights reserved. Gladiators in Rome were regarded as fundamentally untrustworthy and outside of legal protection. It is more useful to think of gladiators as prisoners on death row than as David Beckham with a net and trident. The section in the exhibition where children are encouraged to dress up as gladiators would have appalled any respectable Roman parent (that said, it’s great fun). The Queensland Museum can’t escape the lowly, servile and criminal origins of the gladiators, but it does attempt to moderate our opinion of them by suggesting that some free citizens wilfully chose to be gladiators in search of “eternal fame and glory”. In fact, the evidence of such citizen gladiators is extremely slim. It was almost certainly extreme desperation that forced them into the arena rather than a desire to be remembered by posterity. At another point, the exhibition suggests that the crowd saw reflected in gladiators the virtues of the soldiers who guarded the empire. Such talk would have had any self-respecting Roman legionary reaching for his short sword. Representing gladiatorial combat as sport also inevitably underplays the religious dimension of the fighting. The exhibition includes some fabulous tomb paintings from the city of Paestum, which illustrate the origins of gladiatorial combat in the funerary rites for the dead. These are wonderful works, which deserve to be much better known; however, they are a rare intrusion into an otherwise secular narrative. Gladiatorial combats never stopped being religious events. Every day of the games would begin with a “solemn procession” with sacrifices on altars. The gladiators themselves were deeply implicated in the Roman theology of the divine, death, and the relationship between mortal and immortal. These spectacles were Roman sermons written in blood. 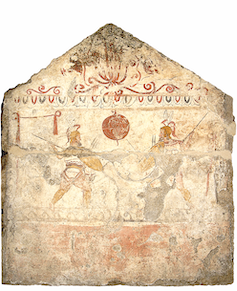 Painted Slab from the Tomb of Andriuolo XXVIII, circa 340-330 BCE. The final problem with focusing on gladiators as sporting heroes is that it tends to isolate their combat from the other elements that made up the games. Beast hunts and the executions of criminals were just as popular, possibly even more so. They were not precursors to the main event or entertainment for the intervals. The executions of criminals could involve extravagant mythological tableaus. Prisoners were dressed as Hercules and burnt alive. The fatal flight of Icarus towards the sun might be re-enacted for the audience. Certainly, these elaborate, gruesome affairs captured the attention of ancient writers far more than the gladiators who accompanied them. Wealthy Romans seemed far more preoccupied with obtaining suitably rare fauna for their spectacles. For the poorer members of the audience, the beast hunts had an added attraction. Often the animal meat was distributed to the audience members to take home. They were literally watching their dinner being butchered in front of them. One of the most intriguing items in the exhibition doesn’t relate to gladiatorial combat but to one of these beast hunts. It is a second-century CE mosaic that features what appears to be a female hunter facing off a giant tiger. Who is this woman? Evidence for female hunters (like female gladiators) is practically non-existent. Is she part of some mythological tableau? A woman pretending to be an Amazon? Or a man dressed up as a woman? Is this a scene from real life at all? She is an enigma and a worthy reminder that the real secret of the appeal of Roman combat spectacle is that it raises more questions than it answers. Gladiators: Heroes of the Colosseum will be on at the Queensland Museum until January 28 2018. Sporting analogies pepper the exhibition. Spectators are routinely referred to as “fans” and the catalogue promises that this is an exhibition that “touches on many issues that have parallels with modern day sport and sporting culture”. At times, the exhibition also feels like it has taken its cues from contemporary videogame culture. The special weapons of the various types of gladiators are spelled out and visitors are invited to contemplate who would win between a gladiator fighting with a net (known as a retarius to the Romans) and one heavily armed (secutor). A videogame spinoff from the exhibition is easy to imagine. These games were never just displays of gladiatorial fighting. At their most elaborate they involved beast hunts with exotic animals, the execution of criminals, naval battles staged in flooded arenas, musical entertainments and dances. The Queensland Museum is not the first to try to understand gladiators as sporting heroes. However, it is an analogy that causes more problems than it solves. Representing gladiatorial combat as sport also inevitably underplays the religious dimension of the fighting. 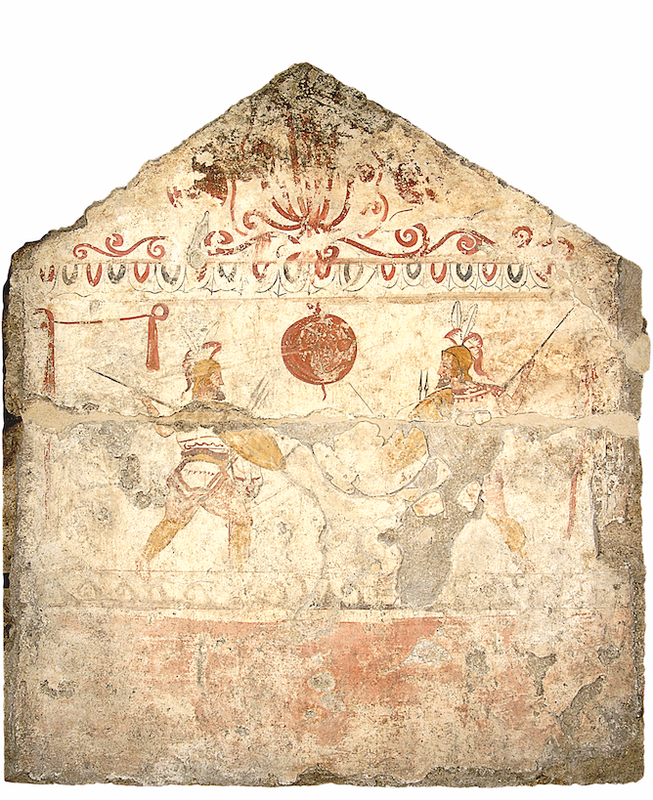 The exhibition includes some fabulous tomb paintings from the city of Paestum, which illustrate the origins of gladiatorial combat in the funerary rites for the dead. These are wonderful works that deserve to be much better known; however, they are a rare intrusion into an otherwise secular narrative. The final problem with focusing on gladiators as sporting heroes is that it tends to isolate their combat from the other elements that made up the games. Beast hunts and the execution of criminals were just as popular, possibly even more so. They were not precursors to the main event or entertainment for the intervals. The execution of criminals could involve extravagant mythological tableaus. Prisoners were dressed as Hercules and burnt alive. The fatal flight of Icarus towards the sun might be re-enacted for the audience. Certainly, these elaborate, gruesome affairs captured the attention of ancient writers far more than the gladiators who accompanied them. Wealthy Romans seem far more preoccupied with obtaining suitably rare fauna for their spectacles.